Adonis Stevenson stopped Chad Dawson with a left hook in the first round to take the WBC light-heavyweight title on Saturday night. Stevenson (21-1), from nearby Longueuil, sent a crushing left to Dawson's temple less than two minutes into the scheduled 12-round bout. Dawson (31-3-0) got up, but referee Richard Griffin stopped the fight. Stevenson, who was fighting at home and moving up in weight from super-middleweight to light-heavyweight to challenge Dawson, erased him with a single, massive left cross in the first round to win the fight and the light heavyweight championship of the world. Stevenson became the only Canadian to currently hold a world title. On the undercard, Yuriorkis Gamboa unanimously outpointed Darleys Perez to win the interim WBA lightweight title. Gamboa (23-0), the 2004 Olympic champion from Cuba who now lives in Miami, floored Perez (28-1) with a left hook in the first round and received winning scores of 116-111, 115-112 and 115-112. 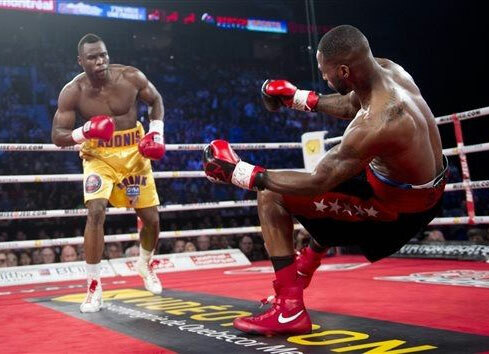 MONTREAL (AP) -- Adonis Stevenson stopped Chad Dawson with a left hook in the first round to take the WBC light heavyweight title Saturday night. Stevenson (21-1), from nearby Longueuil, sent a crushing left to Dawson's temple less than 2 minutes into the scheduled 12-round bout. Dawson (31-3-0) got up, but referee Richard Griffin stopped the fight. Dawson, from New Haven, Conn., took the title last year from Bernard Hopkins.